Business owners or HR managers lift up their head from an ever-increasing pile of work to find out. The entire world of business health benefits and requirements has changed! But it's item C that's accruing a huge penalty. And they won't find out till April. Before you go back to that stack of work, let's lay out the most important ACA changes that all companies need to be aware of. 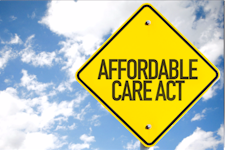 The ACA law has affected the entire benefits market in ways unseen since AB1672 and guaranteed issue. These are the big changes...there's lots of little ones we can't cover without writing a book. This is the big one depending on your company size. We no longer look at "full time" employees only. We look at the "equivalent" of full time employees. Full time employment is 30 hours or more. Less than 30 hours is officially part-time. To calculate your equivalent number, take the total # of payroll hours and divide by # of employees. For example, 10 employees at 30 hours is the same as 20 employees at 15 hours. They both equal 10 full time employees in the new "equivalent" calculation. This important since most employers are use to thinking about full-time employees only. Okay, now that we can figure out the correct equivalent, here's the rule. A company is mandated to offer ACA compliant coverage to employees that's affordable for 50+ full-time equivalent employees. You could have a 100 employees that each work 15 hours and still have to offer coverage. Careful...there are many companies that are on the wrong side of this law. Call 866-486-2551 to find out if you're affected by the mandate. There are actually two different penalties we need to compare. Offer no coverage and pay another set of penalties. Which option makes the most sense depends on a few factors. We can run the full comparison across all three options to see what the total cost and exposure is for each. Get used to a metallic taste when comparing new health plans. All the new ACA group health plans fall within four distinct categories. Silver. Average $2K deductible with copays added. By law, a given plan can't differ from the baseline coverage by +/- 2%. That means we have 4 very discreet levels of coverage now. That being said, the carriers can add here and take away there. For example, the deductible may be lower than average but the copays are not as rich. It does make it a little easier to compare based on core levels...i.e. a Bronze to a Bronze between two carriers. The issue is that many of the old popular plans for companies combined high deductibles for the big bill and copays for the smaller bills. That's harder to come by now. We can quickly quote your company at each benchmark across all the carriers so you can see where the best pricing is. Starting Jan 1st, 2016, large group is now considered 100+ employees instead of 50%. This is big deal for companies with 50 - 100 employees. Large group has always been very different from small group in terms of plan options, pricing, and just general process. For some companies adjusting to Small Group, it can be a big shock in terms of premium. Combine this with the new ACA health plans mentioned above and it's a whole new world. 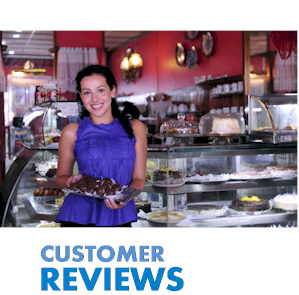 Most companies are being transitioned to Small Grouip at renewal. It's important to run all the numbers a few months prior. 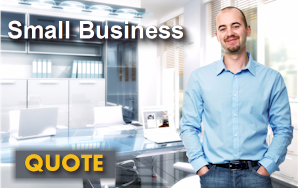 Call us at 866-486-2551 or request your new Small Group quote. More importantly, probably 20% of California companies are likely doing this. Basically, in July of 2015, the IRS came out and ended the debate (but not the misinformation). 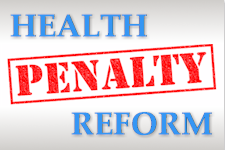 If a company pays towards an employee's individual health plan (whether through Covered Ca or direct with the carrier), they could be liable for a $100/day penalty or $36,500 per year yer employee. $36,500 penalty per employee each year! The IRS is sending a huge signal to employers. Take heed. An employer can either offer a legitimate business health plan or the employees can take care of their own health coverage. 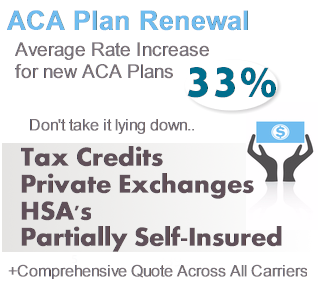 We can either quote business health plans or your employees can run individual (Covered Ca) plans for themselves. Call 866-486-2551 if you need help with these options. We touched on this above in the Penalty section. Full time is 30 hours or more. Part time employees make up partial count towards full time. For example, 12 employees that work 10 hours will equal to 120 hours. This is the equivalent of 4 full time employees (120/30). The law requires that employers look at the prior year's employment to determine their equivalent eligibility. An employer can't just fire a bunch of people Dec 15th or move people to part-time in order to avoid the penalty for the following calendar year. We can help you navigate this whole process at 866-486-2551 or by requesting a quote here. 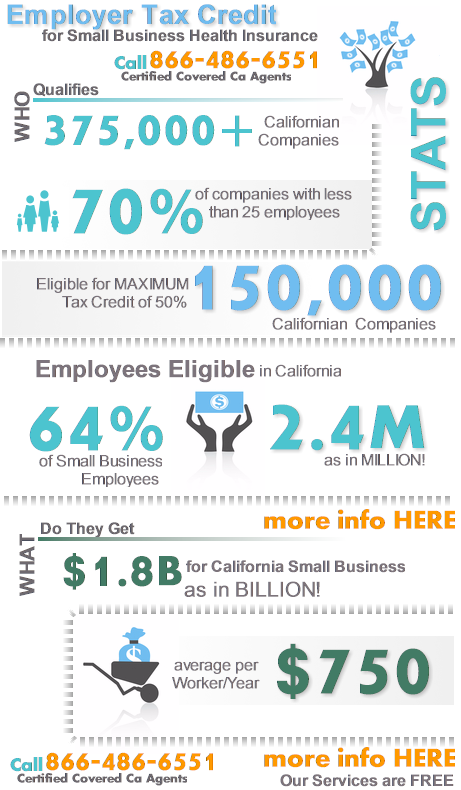 This is a lot of money and only a small percentage of the eligible California companies are enrolled. We're not talking small dollars or low eligibility. 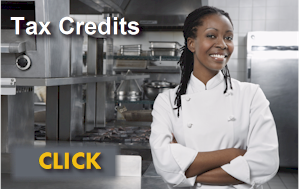 Find out more about the small business tax credit here...it's that important! 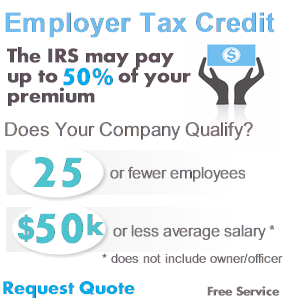 If this might be your company, call us right way at 866-486-2551 or check the "Tax Credit" button when requesting quote here. This is literally found money for 100's of 1000s of California companies from the IRS. Never turn down money from the IRS! Have you noticed all new requests from the IRS for payroll? Did you burn them in celebratory gun-fire? We don't recommend the latter. There are new rules and requirements companies must follow to stay in the good graces of the IRS. Most reporting applies to employers that are subject to the employer mandate (50+ full time equivalents). 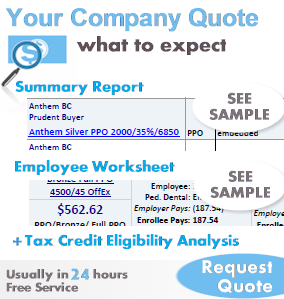 Get more detail on these forms and deadlines from our Employer health plan reporting article. For 50+ FTE companies, the penalty for not submitting individual statements to all full time employees may be $250 per return, up to $3 million. For most companies, the new reporting regime is probably the most confusing. Let us help you navigate this to protect your companies from pretty sizable penalties. Call 866-486-2551 to discuss your requirements for Employer reporting. In the past, some companies had difficulties enrolling in Employer based health plans due to eligibility requirements. The key points of contention dealt with participation (% of eligible employees that enroll) and contribution (amount that employer paid towards employee's health plan). Good news for these companies! As part of the ACA law, the carriers are able (forced maybe) to relax key rules on eligibility. This works for many companies where employee have other coverage or don't enroll. It can also relax the burden on employers that feel they can't afford to afford a group health plan. The Special Enrollment period typically opens 12/1 of each year but we want to have everything ready before then. Request your Business health quote (with a note on Eligibility concerns) here or call us at 866-486-2551 to see if this window might help you. Okay, we've dealt with some of the specific rules and changes from the law. These are a just sampling of the changes. Everything has changed! Watch out for the new penalties! They're big and many employers are accruing them right now....and they don't need to. Let us run quotes across all the different options to see if there's away to avoid penalty, offer affordable coverage, and survive the ACA transition.